Service businesses continue to thrive in the St. Louis area, and starting your own businesses is easier than ever through the St. Louis County website. Providing specific business services like home delivery or specialized expertise to customers requires strategic planning, particularly in today’s overly competitive market. If you’re just opening your doors, finding good printing in St. Louis for promotion is essential to starting off strong. New businesses frequently use door hangers to get the word out about independent services for the local community. For your St. Louis business, door hangers are an excellent way to get people excited about your service in their area. Target certain neighborhoods near your storefront, so you have decent crowds on the day you open doors. With almost limitless customizable options, door hangers can be made to appeal to your specific demographics. Door hangers are printed on superior materials, allowing graphics and colors to pop out to the viewer. Consider adding a perforated coupon or discount card as a way to encourage attendance at your grand opening. Even custom maps are possible, plus detachable business cards for additional promotional tools. Maps look vibrant on door hangers and help give a better visual sense of where you’re located. With digital printing techniques, you can include on door hangers images that you’ve designed, to illustrate the benefits of your services. In fact, with the ease of printing and myriad customization options, getting door hangers out to targeted neighborhoods is one of the best promotional strategies in the industry. Trying to educate the public about what service you have is one of the biggest hurdles to overcome when you’re new to the St. Louis business scene. While door hangers can give a basic rundown of your services and indicate how to find you, table talkers allow you to go into a little more detail. You’ve likely seen table talkers in lobbies of hotels or clinics. The point of them is to relieve boredom when there isn’t anything else to do in a waiting room. Creating a table talker to promote the opening of your upcoming business is a perfect way to grab attention of the right people. The good news is, people have more time in waiting rooms, so they’ll spend more time reading about the details of your business. Made with 30mil plastic material, table talkers have durable components so they won’t get damaged or misshapen. They also have plenty of customization options, much like door hangers. You can print your table talker as either horizontal or vertical, and add QR codes to entice mobile device usage for more info. Colors once again pop out thanks to quality plastic, which means that table talkers get noticed no matter where you place them. 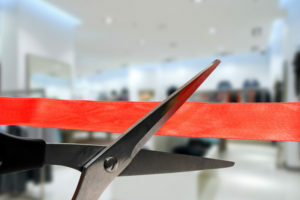 More and more businesses use postcards as an attractive method to advertise grand openings. With the right content, postcards can bring a new kind of edge to your advertising that looks more personal. A potential customer, who receives a uniquely designed postcard that is printed on quality stock, feels like he’s receiving an ad from a friend rather than a business. With heavy card stock options, and vibrant, full colors, postcards advertising your grand opening will show your commitment to quality. Feature a color image of your business service so someone has a vivid idea of what you do. As with door hangers, don’t be afraid to include a colorful map to show people how to get to your location on opening day. Consider some other card stock options like high-gloss lamination, foil finishes, or using environmentally friendly materials. For more proof of how effective it is to print materials for direct mail advertising, plastic mailers are a consolidated way to attract attention to your grand opening. If postcards can provide a unique look to your mail advertising, plastic mailers provide real durability. These send a complete message about your new business—without having to use envelopes. The plastic used is extremely durable so the mailers don’t get mangled when you use them through a direct mailing service. What makes plastic mailers different from postcards is that you can do what you did with the door hangers above: Add detachable discount cards. By additionally printing barcodes or magnetic stripes, a customer can bring these cards in during your grand opening to get a discount off the first use of your service. When you decide to use door hangers, table talkers, postcards, and plastic mailers, you’ll have a complete and entertaining way to introduce your business to the St. Louis public.